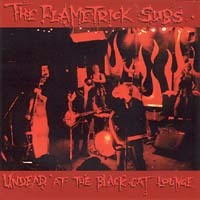 The Flametrick Subs have released two albums: Amaze Your Friends With X-Ray Glasses, and Undead at the Black Cat Lounge, Both will be available soon. All songs are in *.wav format and the quality isn't the best, but enjoy anyway. Order UNDEAD AT THE BLACK CAT LOUNGE online from Hepcat Records!! !